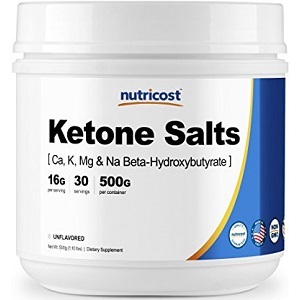 Nutricost Ketone Salts is an all natural supplement that contains different kind of salt molecules that are designed to assist their users to get into a ketogenic state. A ketogenic state assists with weight loss. We assess this manufacturer’s considerations of ingredients and determine whether they offer a quality supplement. When the salts are digested, they release minerals which can be used by the muscles and other organs to conduct their biochemical processes. For example, sodium and potassium are involved in controlling muscle contraction, while calcium helps muscles to contract longer and magnesium relaxes them. The other part of these ketone salts beta hydroxybutyrate, is a ketone. When levels of beta hydroxybutyrate are high enough in the body, the body is considered to be in ketosis. Ketosis is a particular form of metabolism where the body breaks down fats as its source of energy more than it does for carbohydrates. This releases more ketones which can be used by the brain and muscles as a source of energy. Ketosis has been linked quite strongly with weight loss because of increased fat breakdown. Nutricost Ketone Salts comes in a powdered form. One rounded scoop can be added to 8 to 12 ounces of water. The maximum servings that can be taken per day is three. Altogether, there are 17000 mg of ketone salts in the supplement with 13000 mg being beta-hydroxybutyrate. We could not find any evidence of adverse effects associated with the use of ketone salts. However, pregnant women, nursing mothers and customers with chronic conditions, especially for those which they require medication should always be careful and consult a health professional before using this supplement. A container of 500g (1.1 lbs) can be purchased online for $79.95. There is an unflavored option and a lemon lime flavored option. Free shipping is offered for any order that is over $75, which includes this product. This manufacturer does not appear to offer any monthly subscription options or bulk purchase discounts. The manufacturer offers a 100% refund to any customer that is unsatisfied with their purchase. This guarantee can only be applied to one used bottle of the product. This manufacturer does not specify how long this guarantee is valid for. The ingredients in Nutricost Ketone Salts as well as the dosage contained in each serving is quite well considered and does support the manufacturer’s claim about weight loss. The problem with this manufacturer is that they are not entirely transparent and clear about their guarantee. By not telling the customer how long the guarantee is valid for, they run the risk that the customer exceeds the time limit and doesn’t get their money back. This means that customers are not as protected as they think they are when they buy the supplement. We have observed manufacturers with much clearer guarantees and believe customers should look at these instead. John Parker	reviewed Nutricost Ketone Salts	on December 9th	 and gave it a rating of 3.